Design by Paolo Rizzatto, 1992. 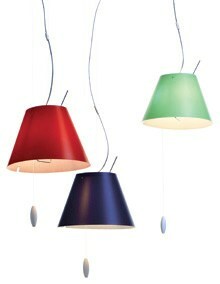 The colored polycarbonate lampshade illuminates with character any room in which it is suspended. The lamp is turned on by means of a rod switch placed next to the light source. The height is adjusted by means of a counterweight. White ceiling canopy and counterweight. Dimensions 10"D shade; height adjustable from 36" to 96". Uses 1 X 60W 120V E12 (candelabra base) G16.5 incandescent lamp (not included).